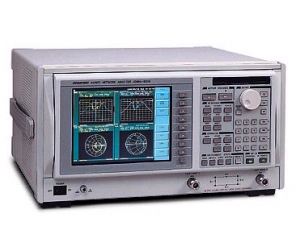 Network Analyzers R3765 and R3767 measure amplitude, phase and group delay. Thanks to high-speed signal processing, the analyzers can perform measurements at a high rate of 0.15 ms per test-point. Models have a TFT colour LCD allowing simultaneous display of up to four diagrams and eight traces. A programmable sweep function is provided in all models and allows the user to define the resolution bandwidth, power level and measurement time for each individual testpoint. An electronic attenuator supports highspeed measurement of the performance characteristics of crystals or compression points of amplifiers. Operation The analyzers of this series are provided with a built-in BASIC controller. Frequently recurring test routines can easily be executed thanks to programmable menu-guided control; an external controller is usually not required. Detailed user prompts can be displayed on the screen in addition to the test results. Limit lines facilitate evaluation of the test results. The required programs and instrument settings can be saved on floppy disk. All models are fitted with an IEC/IEEE bus for external control, the command language is SCPI-compatible. A serial interface (RS-232) for the connection of a printer or barcode reader is available in addition; a user-definable parallel interface allows direct connection of component feeders.